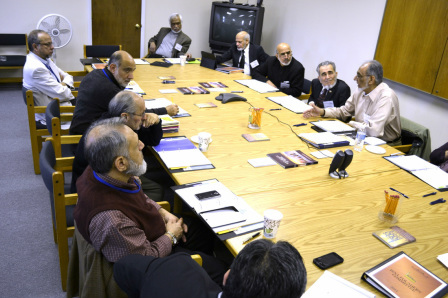 (Plainfield, IN 2/25/14) This past weekend, on February 22, 2014, the IFC had their annual retreat at ISNA headquarters. IFC Chairman, Dr. Abdul Alim Khandekar and IDF Executive Director, Ahmed ElHattab, led the day’s agenda discussions. IFC is a dedicated group of ISNA supporters, which has provided a unique supportive role to ISNA and its Development Foundation for more than two decades, and contributes to its financial stability. The committee participates in meetings and conference calls year-round to give their valuable feedback and guidance, which helps ISNA to stay better connected to the grass-roots level in communities nationwide. This retreat covered a wide range of topics, including leaving a Founders’ legacy, the ISNA Development Foundation’s 2014 events and projects, as well as long-term initiatives that will impact the Muslim American community and society at large. More specifically, the Founders gave well-rounded advice about the organization’s financial endeavors, components of the ISNA annual convention, the Community Service Recognition Luncheon (CSRL) and community-based projects and field visits.